Description: A UP stack train sits and waits for a fresh crew just east of Fremont. Description: Caught this eastbound stacker...with a pair of SD70's up front a NS SD-60 and a trailing T-Motor for power. Description: Rochelle Railroad Park. EB stack train just leaving the container yard facility west of the BNSF crossing. Description: Rochelle Railroad Park. WB autorack. Description: Just couldn't pass up lighting like this. Description: MBNAS 12 in the siding at Ridgely. Description: A trio of Union Pacific SD70Ms take charge of a train full of concrete railroad ties. Description: A mixed UP freight grinds uphill before coasting south out of town. The trailing unit is a recently reactivated ex SP B40-8, the best looking GE freight four axle ever built (in SP paint). Description: Auto racks led by Union Pacific 4328 on Train ASMAR 17 go southbound. Description: Two UP 70M's leads a junk freight towards Alton & Southerns yard using KCS's ex Gateway Westerns tracks, the track to the left is UP/Amtrak rails which there was an Amtrak currently running behind me after I shot this. Description: A NS light power move passes over the Merchants bridge while a UP junk freight passes underneith heading towards the Alton & Southern yard. 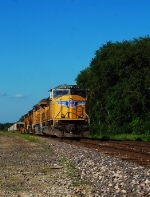 Title: UP 4340 heads up a Sb freight thur east stl Mo. Description: A quatet of EMDs lead a UP mixed freight north through Fort Worth. Description: MPECL heads past Farmington Road.